Parents of children with special needs are no different to any other parents in that you are looking for an environment where your child is most likely to thrive: where they will feel happy, safe and secure and benefit from the kind of teaching, support and pastoral care that enables them to reach their potential. Their work and progress is closely monitored throughout the year. Parental support and assistance at home is invaluable at this stage and can greatly enhance the work done in school. Pupils may also be withdrawn from lessons on an individual basis to receive extra help and support. In Year 7 there is also a ‘Primary Curriculum’ Group which is smaller in number. 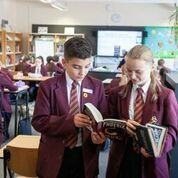 Pupils who require more specialist support for literacy and numeracy or are identifi ed with social, emotional and specific learning needs receive specialist support in a purpose built classroom whilst integrating into the curriculum for creative subjects. We feel that such an arrangement benefi ts those who require additional support, whilst also allowing us to challenge the children who can work to a high level independently. 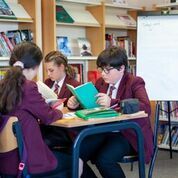 In Years 10 & 11 support is provided for those that require it for core subjects and options. For some pupils who find it difficult to access a full ‘academic’ curriculum they will be directed towards an ‘alternative’ curriculum. This enables pupils to enjoy success at all levels whatever their ability. The school receives funding for statemented pupils. This is delegated to meet each child’s needs according to their Individual Education Plan, reviewed annually, which is produced in partnership with the local Authority. We have outstanding links with the Authority and many other specialist support agencies. They complement our own experience and expertise in meeting the needs of all our children with special educational needs, including the assessment of any child whose needs may emerge during secondary education. Pupils with physical disabilities are also fully integrated into all aspects of the curriculum and receive help from classroom assistants as required in practical lessons.